It’s time to finalize my parts order, which means I have to pick all the rod ends and spherical bearings for the suspension. 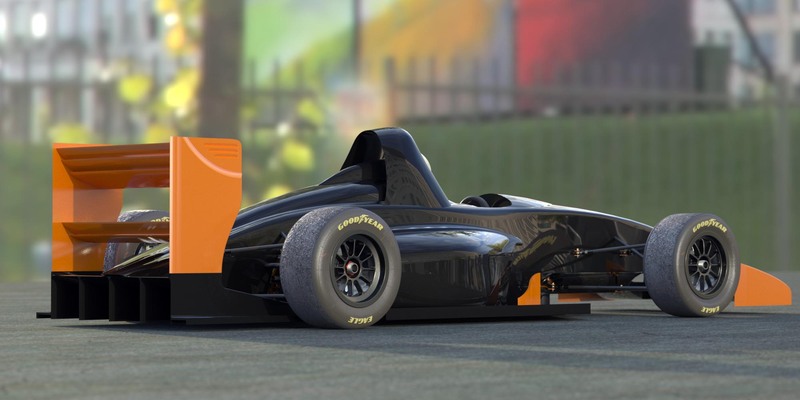 Up to now I’ve relied on rules of thumb, which isn’t good enough for a state-of-the-art race car. 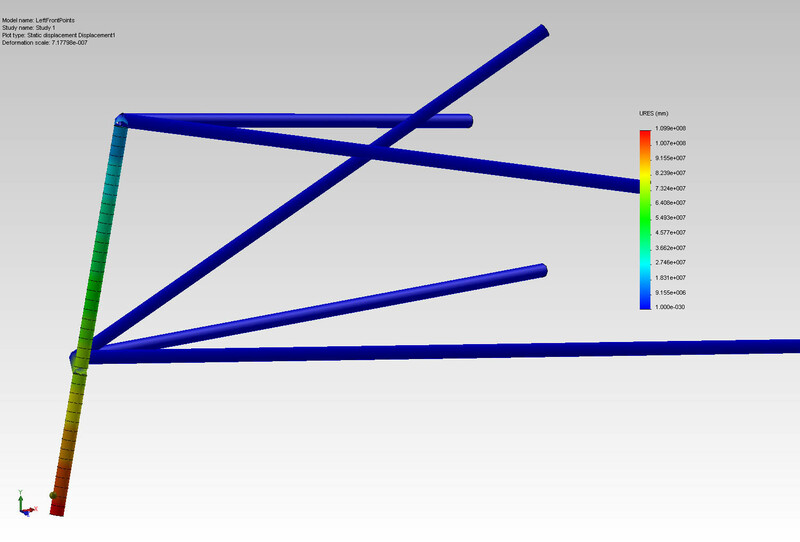 So I simply opened up one of my higher-level chassis models in Solidworks, one with most of the suspension attached, and created a 3D sketch of the upper and lower left front suspension A-arms, constraining the endpoints of the lines to the centers of the rod ends and spherical bearings. Then another line to simulate the upright and tire, and I’m done with the sketch. 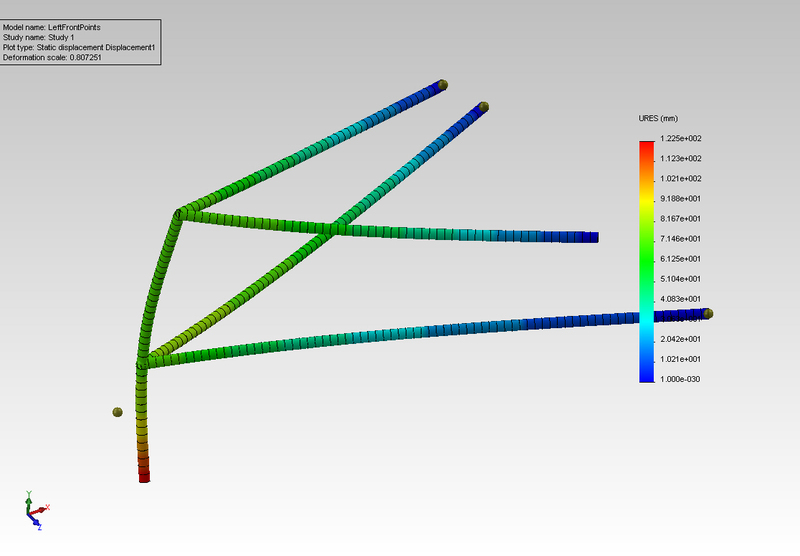 Then I created a structural member along each line and opened a static simulation study. In the study I constrained the inboard ends of the A-arms to zero translation and applied a 1400 pound load toward the rear of the car to simulate 4-G braking. Run the study, and voila! axial loads on each member. This allows me settle on 1/4″ rod ends for the inner upper attachments, 3/8″ for the inner lowers, a 7/16″ spherical bearing for the upper ball joint, and a 5/8″ one for the lower ball joint. All chrome moly alloy. Even these are far stronger than indicated necessary by this analysis, but I don’t want to deviate too far from standard practice on this design. Maybe transitory loads can be far higher? At the urging of a poster on ApexSpeed.com who insisted my calculations were inaccurate due to the non-zero joint stiffnesses, I re-ran the analysis with the suspension a-arms modeled as trusses. A truss model allows only axial loads on a member, using hinges at both ends to zero the moments. This gave me results that were the same +/- 2%, which makes no difference given the uncertainty in estimating the operating loads. Note that including the vertical load and increasing the braking load shifted the most highly-loaded member from the lower rear to the lower front, and increased the maximum load from 3096 to 4432 pounds, or 43%. The chrome-moly 3/8″ rod ends I’ve specified for the lower a-arm inboard joints still have a safety factor of 2.14 under these conditions. The posters on ApexSpeed have strongly warned me against using 1/4″ rod ends in the suspension, so existing inventory will be used in a different application and the upper rod ends will be upgraded to 8mm. It appears that only metric rod ends are available locally. Under these assumptions the pushrod rod ends will have to be further upgraded to 10mm, although I hate to have a whole separate part for just the pushrods, so I’ll have to re-examine the assumptions. This entry was posted in Design, Finite Element Analysis. Bookmark the permalink.